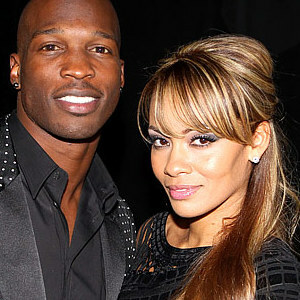 This weekend, professional football player Chad “Ochocinco” Johnson was arrested on charges of domestic violence against his wife of just over a month, reality television star Evelyn Lozada. For those of you who do not follow any of the countless reality television shows, this couple is one that is very visible and widely known by those who frequent mindless debauchery. What I know about Chad is that he is known as Ochocinco, his football jersey number in Spanish. I also know he is extremely arrogant based on conversations with my friends who told me about some docu-drama he was the star of where he coined what was to become widely popular phrases such as “child please” and “kiss the baby.” His television and on-field personalities are the type that you will either love or hate with little room in between. I became aware of Evelyn as a random watcher of the heavily criticized “Basketball Wives” reality show where cameras followed the wives, ex-wives, girlfriends, and baby mamas of professional basketball players. Evelyn’s character is a matter-of-fact, no holds barred and sometimes violent female who wastes no time in telling anyone how she feels, whether it’s with words or a champagne bottle. This couple is well known in social media, as their meeting, subsequent dating, and engagement were all captured on camera. They became such a hot, popular item, the two have their own reality television show highlighting their wedding scheduled to air very soon. Since Saturday, I have seen countless tasteless jokes surrounding this instance of domestic violence and while I understand it all is stemming from the types of people we have deemed Chad and Evelyn to be (although we really don’t know them personally) based on how they have presented themselves on television and a variety of social media sites; it is quite bothersome to me that many comments almost excuse what has happened. Or they down play it by inferring something like this should have been expected, given “how she is” or “how he is.” They make comments like “she should have known.” Let me first say, we don’t know the entire story yet. I’ve already seen contradicting reports on who hit whom. In any event, domestic violence is NEVER okay and we must be careful of the comments we make and the jokes we entertain because you never know who is a victim of abuse. You may think you know your audience, but you really have no idea. Many of those who have been hit, beaten, strangled, choked, kicked, punched, yelled at, talked down to, and/or demeaned often suffer silently out of fear and shame. It is very difficult for these people to admit to themselves, let alone others that they are indeed victims of abuse and what has happened to them is not their fault. The most strong man or woman never speak up about what has happened because the ego is a fragile thing, so for these people to see these types of comments and jokes spreading virally; it sends them further into a cocoon of shame. We know there are signs of abuse, however hindsight is always 20/20 and it is difficult to say what a person should have seen coming. It is easy for anyone to get caught up in a relationship and fall so deep, it seems impossible to get out. Instead of riding on your high horse, take some time to educate on these signs and provide information on how these people can get help. Take your money or paycheck, make you ask for money, or refuse to give you money? Make all of the decisions? Tell you that you’re a bad parent or threaten to take away or hurt your children? Prevent you from working or going to school? Act like the abuse is no big deal or is your fault, or even deny doing it? Intimidate you with guns, knives, or other weapons? Shove you, slap you, choke you, or hit you? If you or someone you know is suffering from domestic violence, the National Domestic Violence Hotline is 1-800-799-7233 (SAFE). This line is available 24 hours a day, not only to victims, but to their friends and family who are seeking ways to help their loved ones. While this is a national line, they are equipped to refer you to resources and safe havens in your local area. They also can help non-English speaking individuals. For those who are hearing impaired, please call 1-800-787-3224. This information was found at http://www.opm.gov/employment_and_benefits/worklife/officialdocuments/handbooksguides/domesticviolence_help/domestic-sec1.asp. It’s all fun and games until someone you know is killed by their abuser. We often criticize reality television programming and label it as irresponsible and degrading to the community. How uplifting is it for you to make a snide remark or forward an abuse joke? Let’s be better than what we accuse them of being because at the end of the day, WE are responsible for our local communities, not celebrities we don’t even know.